When I first considered going to medical school, a close friend took a job working for a company selling natural supplements. We often discussed the pros and cons of supplements versus pharmaceutical grade medicines. My bias at that time which I held through most of my career is the same bias held by many doctors of medicine today. Supplements in general, have not undergone the rigorous testing required by the Federal Drug Administration (FDA). What are their side effects and interactions? How do we know they really work as advertised? 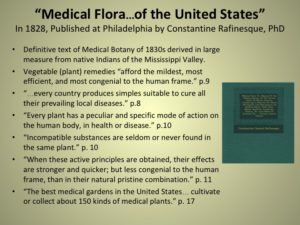 As I’ve researched the field of botanical medicine–and by no means do I consider myself an expert in this area–I’ve taken comfort in three principles outlined in the 1820’s by one of the foremost researchers in botanical medicine of the time, Constantine Rafinesque, PhD in his book Medical Flora … of the United States: 1) Vegetable (plant) remedies “afford the mildest, most efficient, and most congenial to the human frame,” p. 9, 2) “Incompatible substances are seldom or never found in the same plant” p. 10, and 3) “When these active principles (i.e. purified pharmaceuticals) are obtained, their effects are stronger and quicker; but less congenial to the human frame, than in their natural pristine combination.” p. 11. Without question, there can be considerable danger in eating plants in their natural state unscrupulously. For example, foxglove (Digitalis purpurea) or other medicinal plants can be effective in very small amounts, but toxic or deadly in larger doses. However, the above principles I believe hold true, and with proper guidance, natural remedies may affect a cure in a more congenial manner. Dietary supplements that I will recommend have stood the test of time such as a good multivitamin with essential minerals, Omega 3’s, Vitamin D3, Vitamin C, pre-biotics and pro-biotics. Our grandparents survived and thrived without supplements, so why do we need them? Our modern food is more calorie dense and nutrient deficient than our ancestors. We’ve also been learning in medicine how important nutrition is to prevent and cure previously enigmatic diseases. A few months ago I spoke with Dr. Daniel Amen and his wife Tana who have worked to get this information out in a way that can be readily applied. I recommend their Daniel Plan Cookbook as a great place to start. You may also benefit from viewing their recently produced podcast with a prominent nutritional scientist, Dr. Parris Kidd. Based upon your signs and symptoms and most likely diagnosis, I may recommend to you other natural supplements which have stood the test of time such as Ashwaganda (Withania somnifera) or Ayurvedic or Indian Ginseng, an adaptogen that helps to regulate the anxiety response. Ashwaganda has been used for centuries in India, and an increasing body of literature supports it’s efficacy and safety. We are learning through epigenetic research that “food is medicine” and depending on the type, food can either “up” or “down” regulate our genes. These are exciting times. Maybe we have underestimated the importance of our lifestyle habits such as those pertaining to what we eat. Some argue that it would be best if we waited for the scientific research to prove what is best before changing our intake of certain foods or supplements. In a perfect world, that would be a prudent approach. However, good scientific research often takes decades to conduct, and additional decades for results to change medical practice. Our optimal benefit may be now. With little downside to certain supplements, I will likely recommend them as to their likely potential for good, based upon our current knowledge. I will also explain their potential downside so that you can make an informed decision. Increasingly, we have come to realize that we all need to be responsible for our own health as we control up to 80-90% of the risk to develop many diseases through our life styles. As such, consumer-friendly laboratories are making sophisticated laboratory tests available to consumers themselves at bargain prices compared to what would be paid at most hospital or clinic affiliated laboratories. I’ve found Life Extension to have one of the most consumer-friendly sites available. They have arranged special blood panels through Lab Corp. As you will likely need help in deciding which lab tests are most appropriate, and how to interpret the results, please see me first in my clinic. Any diagnostic test including lab tests can be used in an exploratory or confirmatory fashion. Okay, what does this mean exactly? The greatest assurance that the lab results are indeed accurate and not a “lab error” is if they are used to confirm a diagnostic hypothesis generated before the lab test was ordered. Generating these diagnostic hypotheses would be best done with the guidance of a health professional skilled in this area such as a medical doctor. Shotgunning labs, or ordering a bunch of lab tests just in case you might have a disease, is more likely to result in errors of diagnosis. The exploratory use of lab or diagnostic tests in this manner is not only expensive, but increases the likelihood of error. This phenomenon is related to the probabilities of predicting disease that is characteristic of each diagnostic test, and compounded when multiple tests are ordered indiscriminately. Bottom line recommendation: Visit me or another health professional before ordering lab or other diagnostic tests so that together we can generate the most likely diagnoses explaining your signs and symptoms. Then, with that guidance, we will order those tests that will most likely confirm or exclude one or more of the diagnostic possibilities identified. To optimize this process, set up a Comprehensive Visit and complete the Patient Intake Form prior to your first visit (See Steps To Consult Dr. Chapman for additional details). During that first visit, we will discuss your signs and symptoms and generate the most likely diagnostic possibilities. You may have some diagnoses you are already concerned about. Through clinical reasoning together, we will decide which diagnostic tests or procedures make the most sense and are worth the cost to obtain them. Please note, that even though as a medical provider I have “opted out of Medicare“, the payment of your diagnostic studies including labs should not be affected. However, Life Extension, for example, provides lab tests at very reasonable prices perhaps as conciliation to their not taking insurance or Medicare.